Volkswagen, despite being a German company, is one of the most indelible American icons. The Volkswagen Beetle took America by storm in the 1960s, and rocked Detroit's perceptions of what the U.S. consumer wanted in an automobile. If the 60's counter-culture had "official automobiles," the Beetle and the VW Microbus van were them. Besides the auto industry, Volkswagen and its ad agency Doyle Dane Bernbach also redefined the advertising business in the 1960s, introducing sophisticated humor and brand storytelling to TV and print advertising. But mismanagement and the arrival of Japanese brands like Toyota and Honda in the 1970s pushed VW to the fringes of the U.S. automobile market. By the early 1990s, the company was gasping for air in America and pondering an exit from the market it so dominated two decades earlier. Starting in 1994, though, when VW showed a concept car at the Detroit Auto Show for a "New Beetle," and continuing through 199 when it introduced the car for sale, the company mounted a solid comeback that is still going on in the second decade of the new century. 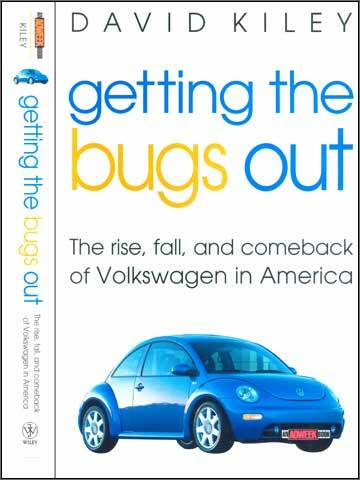 Kiley captured the narrative story of one of the leading business and cultural phenomena of the 20th century, and won the 2001 Ken Purdy Award for Excellence in Automotive Journalism from the International Motor Press Association for "Getting The Bugs Out." "...Kiley has written an entertaining insight into one of the more interesting corners of the car industry..."
"...engaging and informative...essential reading for anyone involved in promoting a brand." "..it is a fascinating and sometimes inspiring read.."
"..offers a fascinating insight..a riveting read.."
"[Kiley] deftly reports on the mystique and the reality of one of the auto world's enduring legends." BMW is perhaps the most admired carmaker in the world -- renowned for a level of luxury and performance that inspires near fanatical loyalty in its customers. While other carmakers struggle with falling sales and hefty rebates, BMW in most years can't make vehicles fast enough. Financial setbacks, inevitable in any industry, seem to be only temporary for the famed German company. Combining world-class engineering, intelligent management, and a unique corporate culture, BMW produces consistently superior cars that are the most benchmarked vehicles in the industry. Even before Toyota experienced the set-back of "sudden acceleration" charges in 2009 and 2010, the Japanese company was perhaps the most benchmarked company in the auto industry for production methods and efficiencies. But BMW has long been the company other companies benchmarked for product -- design, driving experience, ride and handling. This book examines BMW's business practices, history, management philosophy, culture and dominant personalities. "He methodically interviewed top management and industry experts. Then, he put his pedal to the metal. 'Every time I slip behind the wheel, it leaps out at me -- an authenticity and a sure-footedness that characterizes nearly all the vehicles BMW produces.' In the end, he has written a book that preaches to the choir. Kiley's keen interest in the nuances of marketing and branding is apparent. He spends the heart of Driven exploring the depths of BMW's three-decade, single-focus philosophy of selling cars. The strategy: 'The Ultimate Driving Machine.'" "David Kiley has captured what made the company and the brand so special ... it is a valuable read for anyone in business ... a fun and important story about a fun and important brand." "David Kiley has painted a vivid and insightful picture of the genesis of Volkswagen ... an intimate view of the personalities and business intrigue in the unfolding Volkswagen drama." Automotive Research, Ann Arbor, MI. "The bottom line is that this book is both a history lesson in brand development and the making of a corporate icon and a walk down memory lane for a generation of Americans who fondly recall bell-bottoms and platform shoes." "A lot of us in the auto industry watch and study BMW closely because it does so many things right. Lately, it has made many controversial choices in designs ad new products that are testing its track record. David Kiley does an excellent and timely job of exploring what has been right about BMW and asking the right questions about whether it will continue to lead then industry in brand and product focus and excellence. A fascinating read." "Kiley takes a look under the hood at BMW with this journalistic review of the German brand from past to future. 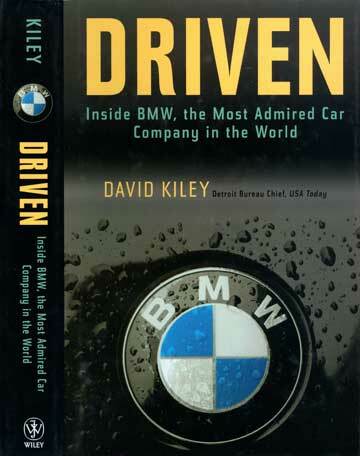 Concentrating heavily on the personalities at BMW, Kiley places the reader in the context and competitive landscape of BMW's history and present."